The Panchen Lama is the second highest ranking lama after the Dalai Lama in the Gelugpa (Dge-lugs-pa) sect of Tibetan Buddhism (the sect which controlled Tibet from the 16th century until the Communist takeover). The successive Panchen lamas form a tulku reincarnation lineage which are said to be the incarnations of Amitabha Buddha. The name, meaning «great scholar», is a Tibetan contraction of the Sanskrit paṇḍita (scholar) and the Tibetan chenpo (great). Who is the true present (11th) incarnation of the Panchen Lama is a matter of controversy: the People’s Republic of China asserts it is Erdini Qoigyijabu, while the Tibetan Government in Exile maintains it is Gedhun Choekyi Nyima, missing since 1995. 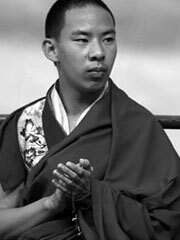 The Panchen Lama bears part of the responsibility for finding the incarnation of the Dalai Lama and vice versa. Furthermore, the search for the late Panchen Lama’s reincarnation, or any reincarnation, is a religious matter. In the case of the Panchen Lama, the religious procedures traditionally involves a final selection process by the Dalai Lamas. This has been the tradition since the Fifth Dalai lama, Ngawang Lobsang, recognized his teacher as the Panchen (Great Scholar) Lama of Tashilhunpo Monastery (Bkra-shis Lhung-po) in Shigatse (Gzhis-ka rtse). With this appointment, Lobsang Choekyi Gyaltsen’s three previous incarnations were posthumously recognised as Panchen Lamas. The Fifth Dalai Lama also recognized Panchen Lobsang Yeshe (Blo-bzang Ye-shes) as the Fifth Panchen Lama. The Seventh Dalai Lama recognized the Sixth Panchen Lama, who in turn recognized the Eighth Dalai Lama. Similarly, the Eighth Dalai Lama recognised the Seventh Panchen Lama. Chosgyi Gyantsen, the 10th Panchen Lama, was an important political figure in Tibet following the 14th Dalai Lama’s escape to India in 1959. However, in 1968 he was imprisoned; in 1977, he was released but held under house arrest in Beijing until 1982. In 1983, he married a Chinese woman and had a daughter, a highly controversial behavior for a Gelug lama. In 1989, the 10th Panchen Lama died suddenly in Shigatse, Tibet at the age of 51, shortly after giving a speech critical of the Chinese occupation. His daughter, now a young woman, is Yabshi Pan Rinzinwangmo, better known as «Renji». Although some organizations have criticized the 10th Panchen Lama as a Chinese puppet (or worse), most scholars (and the 14th Dalai Lama) believe that he did the best that he could to help his people in an impossible situation. The current Dalai Lama, Tenzin Gyatso (Brtan-‘dzin Rgya-mtsho), named Gedhun Choekyi Nyima (Dge-‘dun Chos-kyi Nyi-ma) as the 11th reincarnation of the Panchen Lama on May 14, 1995 but the government of the People’s Republic of China quickly named another child, Gyancain Norbu (Rgyal-mtshan Nor-bu). The former child was taken into «protective custody» by the PRC authorities and his whereabouts remain unknown.